Hellgate: London is finally poised to return to American shores as HanbitSoft has acquired the worldwide publishing rights to the game from Namco Bandai. Hellgate: London sounded great before it launched: A Diablo-esque action RPG with integrated online gameplay, set in a post-apocalyptic London that's been overrun by demons. The reality was somewhat less thrilling, however; the game brought home average reviews, suffered from numerous issues at release and stumbled over inconsistent follow-up development and support. Flagship Studios, the game's developer, closed up shop in July 2008, leading Namco to step in and assume control, but by October of the same year it was announced that the game itself was also shutting down. Confusion about the game's ultimate future reigned for some time thereafter. 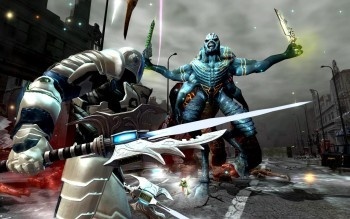 Korean publisher HanbitSoft bought the property after the game collapsed and continued to operate it in Korea, where it has met with success, and while on several occasions it expressed interest in bringing the game back to North American and European players, it was unable to do so because Namco continued to hold the publishing rights to those territories. But that doesn't appear to be an issue anymore. HanbitSoft announced today that it has acquired the worldwide publishing rights to the Hellgate franchise and plans to bring it back to the rest of the world later this year. An updated version of the game known as Hellgate: Resurrection, which was recently launched in Korea, will appear first in China, Taiwan and South-East Asia, after which it will be released in North America, Europe and Japan. "Hellgate: Resurrection is heading towards success in Korea such that we decided to push ahead with launching the game overseas next year," said HanbitSoft CEO Kee-Young Kim. "We will do our best to get the game to the fans as soon as possible." No time frame for the relaunch was given, but HanbitSoft said the number of Hellgate players in Korea is "rapidly increasing" in the wake up the update. In spite of its rough launch, I'm looking forward to finally trying this one when it comes back. I think the concept is great and now that it's had a couple of years to simmer, it might turn out to be a very good game the second time around.